Catch him if you can. The Fugitive is on the run! Harrison Ford and Tommy Lee Jones race through the breathless manhunt movie based on the classic TV series. Ford is prison escapee Dr. Richard Kimble, a Chicago surgeon falsely convicted of killing his wife and determined to prove his innocence by leading his pursuers to the one-armed man who actually committed the crime. Jones (1993 Academy Award and Golden Globe winner as Best Supporting Actor) is Sam Gerard, an unrelenting bloodhound of a U.S. Marshal. They are hunted and hunter. And as directed by Andrew Davis (Under Siege), their nonstop chase has one exhilarating speed: all-out. 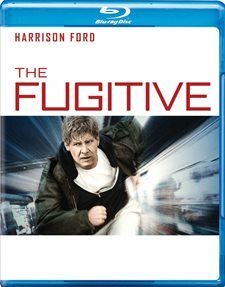 Download The Fugitive in Digital HD from the iTunes store. 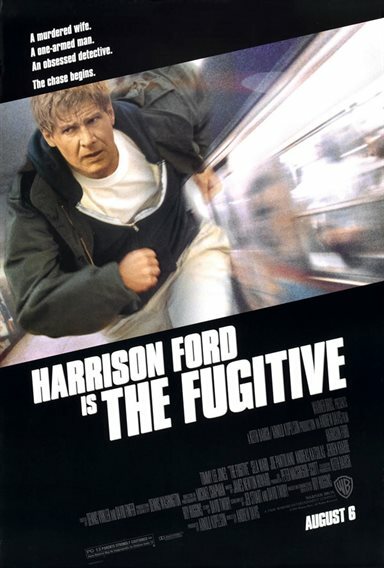 The Fugitive images are © Warner Bros.. All Rights Reserved. The 20th Anniversary Edition of The Fugitive has been released with all the heart pounding action that appeared on the big screen in 1993. The thrilling adventurous chase has always been the hallmark for which many subsequent films have imitated. Relentless in pursuit, the film takes you on a fast paced ride keeping you on the edge of your seat. The story involves Richard Kimble (Harrison Ford) a convicted murder of his wife Helen (Sela Ward) who escapes when the bus taking him to prison gets upended. On the run U.S. Marshall Sam Gerard (Tommy Lee Jones) gets called in to track him down. Kimble takes advantage of his new found freedom to try and prove himself innocent by tracking down a one armed man (Andreas Katsulas) who he saw fleeing the scene of his wife's murder. The over two hour film flies by with the compelling storyline. Director Andrew Davis (Collateral Damage, Holes, The Guardian) movies his actors through a labyrinth of situations and locations going at a fast clip with near catches by Gerard and narrow escapes by Kimble. Ford gives one of his best performances outside of the Indiana Jones series while Jones walks off with an Oscar for Best Supporting Actor for his work in the film and rightly so. The whole cast from main stars to sub supports are magnificent in their roles. The camera work and the stunts are outstanding from the prison bus escape to an exciting train sequence and on to many foot chases, the men behind the lens shoot a film that dazzles and grips its audience to the very end. Close ups of both Kimble showing his fear, anger and anguish tell his side of the story and Gerard doing his duty with a relentless determination keeps his reactions cold and calculating. The special bonus features are very good and add a couple that were not included on the 2006 Blu-ray release of The Fugitive. "Commentary with Andrew Davis and Tommy Lee Jones" The two talk about the direction, acting, music and cinematography while you watch the film for a second time. "Introduction by Andrew Davis, Harrison Ford and Tommy Lee Jones" Mostly handled by Davis and Ford this short piece is priceless and a must see. "On the Run with the Fugitive" This piece is more of a "making of" lasting nearly a half hour of what they went through to make this labor of love. "The Fugitive: Thrill of the Chase" This lengthy documentary features actors, producers, editors who talk about the film in retrospect. Even Jane Lynch who was a young woman when she had a role in the film has a shot or two. "The Fugitivie TV Pilot" A look at the full length pilot of the remake of the television series that aired in 2000. "Derailed: Anatomy of a Train Wreck" The short shows how they made the awesome train wreck scene. The video quality is very good with its16x9 1.85:1 aspect ratio giving a widescreen view of the action that fills the whole screen. The clear, drab crime feel of the movie sends a cold dark thrill as the chases commence. Most scenes are without any distortion although I expected that it would contain some side effects due to the transfer of the image from film to disc. The interior shots were lighted properly and the exterior street foot chases, especially during the parade are nicely presented in Blu-ray. The sound quality using the DTS-HD Master Audio 5.1 provided is extremely good even from the television speakers. But for extra excitement if you have upgraded sound, you'll experience a lot more with surround and special sound effects from both sides. The dialogue is very clear and clean with the music sound track by James Newton Howard (The Sixth Sense) nicely blended within the production.